The EA is a system that trades the signals generated by the following indicators: Bollinger Bands, Stochastic and Moving Average. The EA works from 00:05 to 08:00, terminal time. By default, all orders are closed at 23:59 (can be modified). Important!!! The EA operation start time should match the American trading session close time, while the operation end time should coincide with the European trading session open time! Optimal settings (.set files) are to be published in the comments. MartinOrder - enable/disable martingale. The martingale in this EA is non-standard - a compensating order is opened only for one losing trade. In other words, the EA does not build an order grid. Start deposit - for example, if Lot is 1, while Start deposit is 1000, and there is 5000 on the account, the EA opens the first order with the volume of 5. Lot - take the specified lot and compare it with the next parameter. Maximum Lot - maximum allowed lot. Maximum Spread - maximum allowable spread. Start Time - time to start trading. Stop Time - time to stop opening orders. Stop All - time to close all orders at a market price. Stop Martin - time to close all compensating orders (opened by martingale) at a market price. Maximum Gap - maximum allowed gap (distance between the current price to fast MA). Period slow MA for buy - slow MA period for buy trades. Period fast MA for buy - fast MA period for buy trades. Period slow MA for sell - slow MA period for sell trades. Period fast MA for sell - fast MA period for sell trades. STOCHASTIC - Stochastic parameters used for trading. BOLLINGER - Bollinger bands parameters used for trading. NightRaven with the dynamic lot disabled. NightRaven with the dynamic lot enabled. In addition to all of the above, there is an option to enable or disable the Martingale function. Установил советник около месяца назад. Результат торговли отличный. Да, есть просадка, но если придерживаться правил манименеджмента то просадка очени маленькая (главное это один из немногих, который не сольет ваш депозит). Единственное правило, это брокер с низким спрэдом. It seems by the tests that it worths a lot! 29-9-18 : I use it at real account and till now I am very satisfied. Купил данного робота совсем недавно,но для того что бы его оценить,нужно понимать его логику - обычный обозреватель вряд ли поймет логику робота,трейдер - поймет.Брокер тут не при чем,робот работает у разных брокеров,их есть огромное количество что бы выбрать,вас никто не обязует брать тот или иной. Its crazy profits made me very shocked. I am very grateful to Maksim. I will test it well. Всем привет! Спустя некоторое время решил удалить свой отзыв и написать новый, потому что информация обновилась по моему опыту и теперь готов дать объективную оценку, если захотите покупать данный продукт, учитесь на моих ошибках. Я хорошо отношусь к автору как к программисту, он мне писал советника и здесь нареканий нет, но что касается робота Night Raven Martin - есть замечания. Во-первых, брокер https://fx-private.com/ , по которому отражается статистика торговли, не работает с гражданами РФ, не знаю с кем он вообще работает, может только с гражданами Украины или еще кого-то, в общем, не известно, обязательно уточните или откройте вначале счет и погоняйте деньги туда-сюда, может это "кухня". Во-вторых, я пытался работать на демо по другим брокерам, но через какое-то время депозит сливался. Автор мне так же не смог помочь и например дать готовые сеты. Я думаю, если бы другие брокеры работали, то автор бы разместил статистику по ним, правда? В итоге я имею купленный продукт, который не работает на других брокерах, в общем продукт сырой. Были замечания автору, чтобы он изменил временной параметр, для удобной оптимизации и поиска прибыльных сетов, но пока безуспешно. В общем, если автор хочет продавать готовое решение, я считаю, что оно должно работать на нескольких брокерах. Хорошо, что я купил его по минимальной цене и не попался сейчас, когда цена просто космическая. Похоже на красивую рекламу без подробностей. unfortunately at least two of these reviews are fake, the author changed the price to free for around 48 hours, luckily I grabbed it for free during this period, lol. After further testing and identifying a small mistake in coding for 4 and 5 digit brokers, which Maksim fixed really promptly, I have further signals running on live accounts with different brokers e.g. 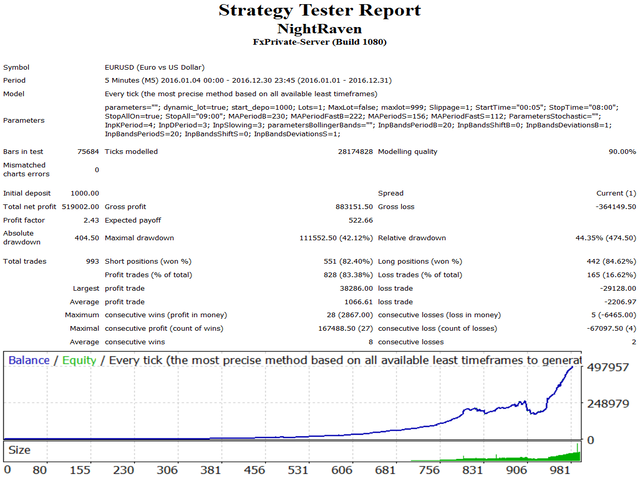 https://www.mql5.com/en/signals/364819. One thing the author is right about is using a low spread / commission broker. Traded lot sizes can grow quite substantially and the spread needs to be kept tight for profitability. The product is "customisable" with its parameters and optimisation is recommended to match your broker trading conditions. Besides FXCC, I am also running the product on Alpari and Tickmill. I have had mixed results with the ea. For me it started to work on eurusd for two weeks, I am now using different pairs and results have been up and down. Not exactly what I expected from the result. Author has been there to answer my questions and said he can only guarantee his result on his broker which I cannot use. So I trying to optimize on other pairs with my ecn broker. Excellent product, highly recommended.one of the best EA in the Market. Its very very good EA its make great profit. the Authors of the product is Very great person. always ready for support. excellent developer. Bought the ea for 500 usd, author is changing price constantly from 500 to 200 to grab buyers. This is not an honest sell marketing. Also have to say that my trades does not match the trades from the author signals. My trades are much worse. I use regulated Australian forex brokers. The broker author uses in his signal is not regulated and doesnt have good reputation. Even with the set files provided from author the EA does not perform well. 1. Added the ability to set the maximum allowable spread. 2. Changed the logic of closing deals (now the deals are closed in full when reaching the middle of the Bollinger channel). 3. Added tracking a broker's commission and swap to define an order's unprofitability. 1. Added the ability to change the magic number. 2. Fixed a bug with the "Gap" parameter. 3. Added the ability to select trading days. And most importantly - the EA now works well with many other brokers! Changed trade execution algorithm to make the EA more versatile (suitable for most brokers).